Marcelline Moody currently lives in Victoria where she has recently retired from the Victoria Conservatory. 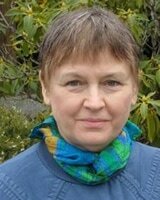 She has also been a clinician with the Vancouver Symphony's Crescendo program. She was Music Education consultant with the Winnipeg Symphony Orchestra for almost 20 years, preparing students for listening to the symphony, and training school students for live movement performances with the WSO and she began a similar programme with the Victoria Symphony. Since retiring Marcelline has also followed a life-long interest in composing and arranging, especially pieces for children. Her great love is the recorder. She has recently published recorder manuals “Reach for a Star”, books 1 and 2. Teaching notation in a hands-on, “de-mystifying” way is another of her passions. Marcelline Moody (B.A., U of W.A. ), is an Orff graduate of the University of Manitoba, Canada, and she has her diploma in Advanced Studies in Music and Dance Education from the Special Course at the Orff Institute, Salzburg. In June of 1986, she was awarded the Bronze Medal of the town of Ouistreham in Normandy for her services to music in the community there. She is a recipient of the Morna-June Morrow Award for Teaching Excellence in Manitoba and in June of 2004 she received the Arts in Education Award from the Manitoba Foundation for the Arts.